Q: How do I add library resources to my D2L course using Reading List? Reading List is a new feature for D2L provided by KSU Library System through EBSCO. 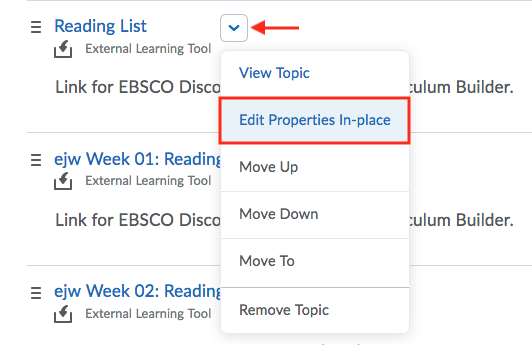 Faculty can search for and add library resources to their D2L course directly through their instructor interface. Follow the instructions below to get started. 1. Log into D2L as an instructor. 2. Open the "Content" tab. In the module in which you wish to add the Reading List, open the "Existing Activities" menu (next to "Upload/Create"). 3. Click on "External Learning Tools". Select "Reading List" as the option. 4. As with all External Resources, you will be able to change the title of this Reading List to suit your needs. To edit the name of your Reading List, choose the menu option "Edit Properties In-place". You can add as many Reading Lists to your course as you like. However, if you have not changed the default name of your first Reading List, you will be asked the next time you create a Reading List if you'd like to copy your original list or start a new list. You can prevent this by renaming your lists in your course module (see above). 5. After opening your Reading List, a search window will appear so that you may begin collecting resources from the KSU Library System. This search box leads directly to KSU SuperSearch, our search engine that accesses the vast majority of the library's digital resources. Some specialized material, however, may only be available directly through its own database. Please contact your liaison librarian or the KSU Library if you need help locating a resource for your Reading List. 6. Use the search interface much the same way you would use SuperSearch on the KSU Library website. Use keywords, limit your results, and choose which resources to add to your Reading List by selecting the option below the resource entry. 7. After you've added resources to your Reading List, organize your resources into folders, add a text introduction, or reorder the list. You can also make your list public to share with other KSU faculty or add links to resources not provided by KSU Library System. 8. Contact the KSU Library System with any questions at libraryreference@kennesaw.edu. Students: email studenthelpdesk@kennesaw.edu or call 470-578-35555.